I bring to you today one of my favourite go to eyeshadow palettes at the minute. 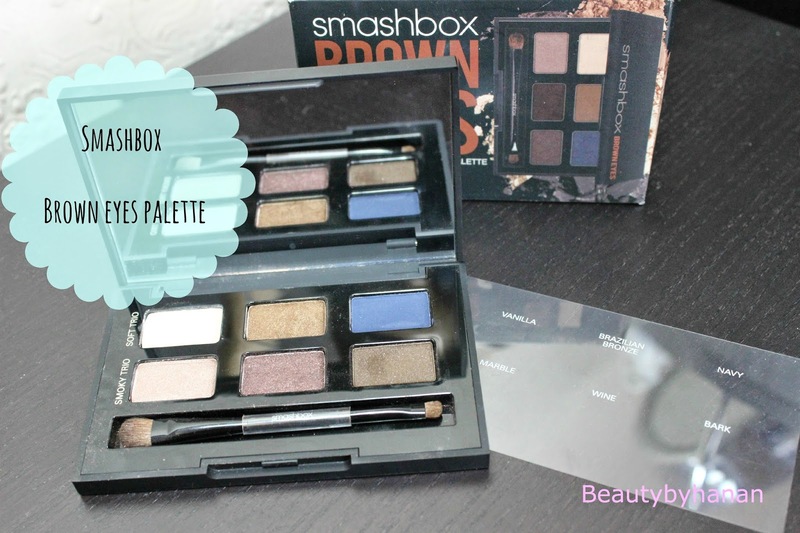 The Smashbox Brown eyes palette. It's supposed to only be for those with brown eyes and I found them to really compliment my brown eyes but I am sure people with Blue and Hazel eye colours would be suited to these shades as well. They are really pretty shades and come in a palette of 6, the top row is called Soft Trio and they are meant for a day look. here is a swatch of these 3. 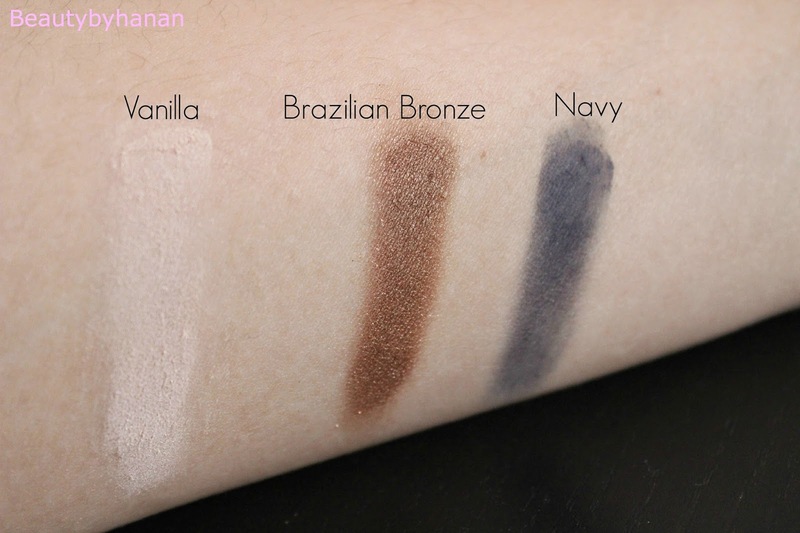 Vanilla is a matte white eye shadow followed by the Brazilian bronze which is an almost golden bronzy brown and the Navy shade which is a dark blue. The soft trio are all matte finish. Ideal for that day time look. I found the Vanilla and Brazilian bronze to be really pigmented but the Navy wasn't as pigmented and required me to apply it a few times until I was happy with the look. The second row is called Smokey trio. They all have a shimmery finish for that evening look. Marble is a soft pinky shimmer which is really pigmented. Wine is a deep burgundy red with shimmer. Wine was one of the colours I was most drawn to, but I wasn't entirely happy with the finish as it didn't appear as burgundy and shimmery on the eye lid as it did in the palette. Bark was a medium dark brown with a shimmery finish. 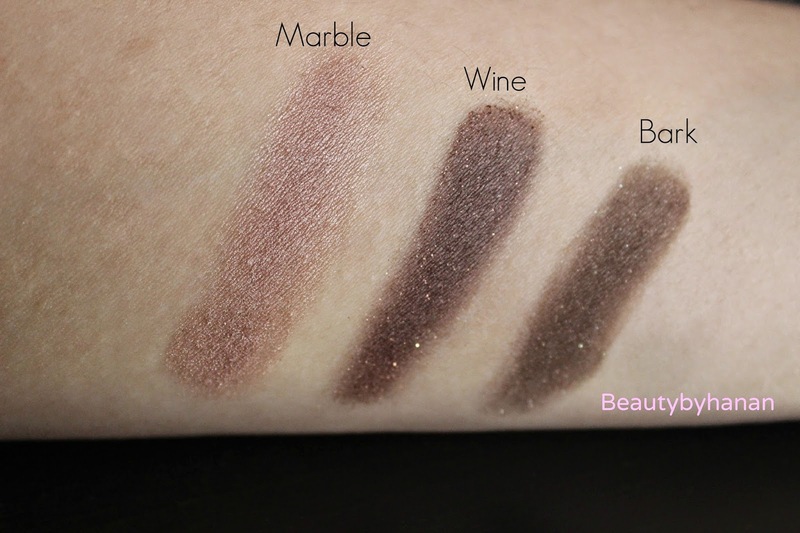 Depending on your style and taste I think that the soft trio and smokey trio are both wearable both night and day and you can mix and match them up. Overall I do love these colours I'm really drawn to their richness. The packaging is a square black palette with a clean matte like finish. It also has a huge mirror inside the palette which is handy for makeup application on the go. It comes with a dual ended makeup brush. You can purchase this Smashbox palette from HERE for £32.00 I know in the UK that most boots stores have a Smashbox counter in store now. Whats your favourite eyeshadow palette at the moment?